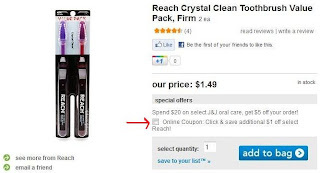 $0.49 for 2 Reach Crystal Clean Toothbrushes + Free ShopRunner Shipping + 12% Cash Back! If you have ShopRunner, you can score FREE shipping! Even better, you can go through Ebates and score 12% cashback. It's not much, but we all know it all adds up! 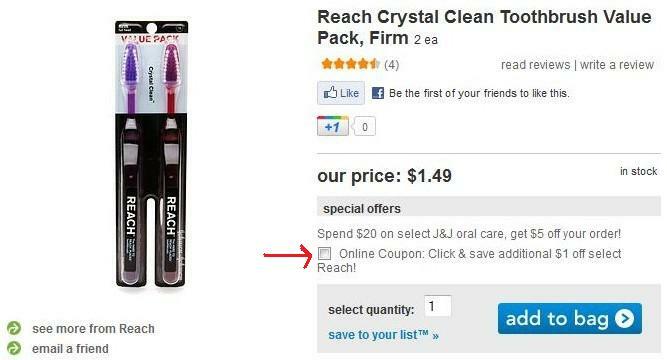 Click here to shop via Ebates, and search for Reach Crystal Clean Toothbrush Value Pack when you get to Drugstore.com. Just so you know I just tried to do that online-------- But it says that this item is Ineligible for ShopRunner Shipping------------- You definitely need to check your facts before you go posting stuff online and then getting people's hopes up!!!!!!! @LHake...my facts are definitely facts when I post the deals. I can't keep re-checking the deals all day to see when they expire or when coupons run out of prints. I personally did this deal when I posted it and got free shipping. I'm sorry that when you saw this post and the Hershey's post (several hours after I posted them) that the deals were no longer good. I do however, appreciate comments from readers letting me know, nicely, that a deal or coupon has expired. So thank you for letting me know.